12' to 14'. Plate and Upright included in rental fee. Setup Fee Not Included in rental fee. Lighting can be added to all for an additional fee. Columns can be hung from ceiling or free standing on floor. Note: These items are offered in our home decor location only of Iowa. We do not ship this product. 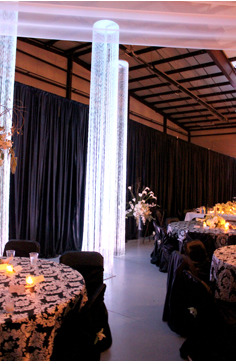 DYI rental service for crystal beaded columns available.